Pizzeria Magpie is managed by the same family of restauranteurs as Sparrow (5322 boul. St. Laurent) and is located on Rue Maguire just down the street. I was there for take out, but got the chance to sit down and talk to the friendly staff while my order was prepared. 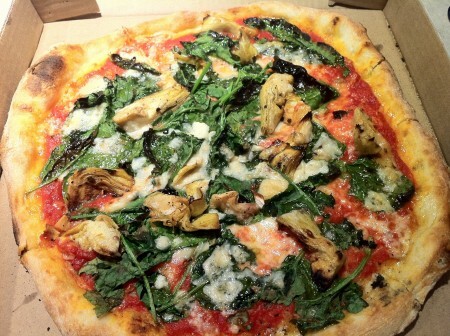 This time I went for the Artichoke Pizza with spinach, fontina, parmesan and tomato sauce. There was a perfect amount of artichokes on the pizza and they were well cooked and tasty to bite into. The crust was crunchy and on the thinner side – all dough is made from Caputo pizza flour. The menu also offers classics like the Margherita as well new ones like the Fennel Sausage pizza. Tags: Artichoke, Magpie, Montreal, Pizza, Vegetarian. hi! love magpie but i feel you should note that it’s not actually the same people as sparrow, the owners of magpie just own the building sparrow is in!